How to choose natural stone pavers for setting the right pathways? 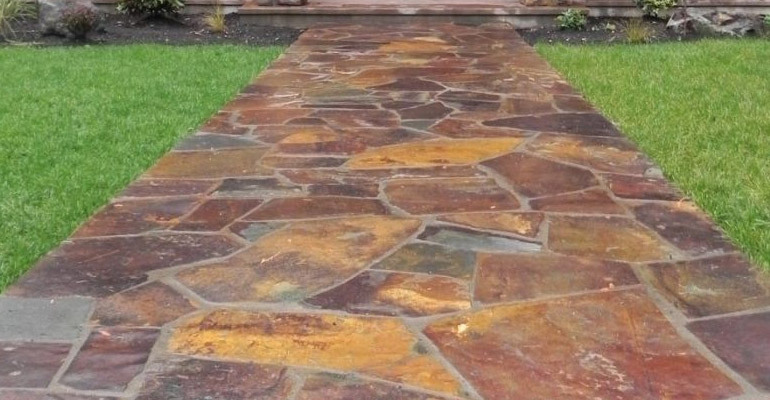 Natural stone pavers for pathways are a unique yet smart way to link your home with its surroundings. 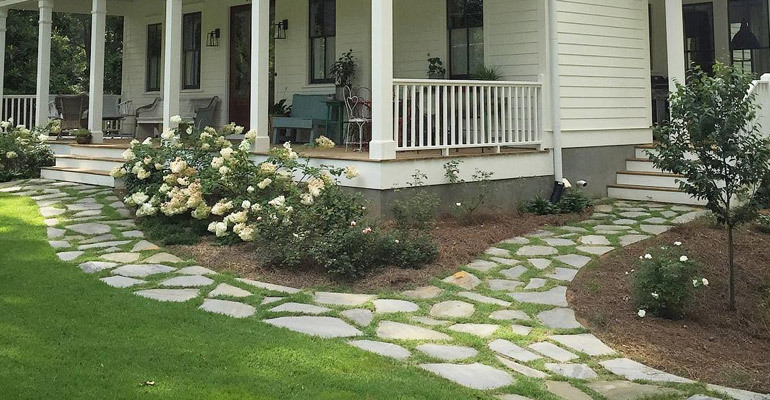 Whether in the form of zigzag pavements or stepping stones in the garden, or a straight walkway leading to the front door of your house from the main entrance, natural stone pavers are a great value addition to your property. 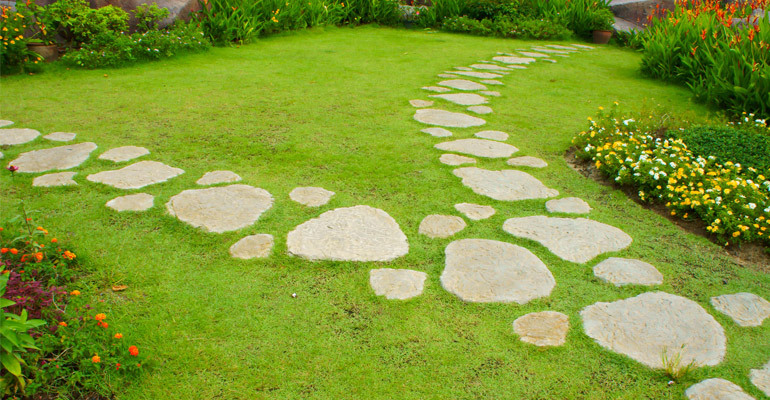 Pathways are usually created with flagstones – a common term for any type of natural stone that can be broken down into irregular, square or circular pieces; depending on the requirement. A flagstone can be made out of limestone, sandstone or quartzite. Its size may vary from 1-2 feet and the height is generally kept 3/4th of an inch to 3 inches. As per the choice of the natural stone and finish, flagstones can be obtained in different color combinations, shades and textures. Every natural stone occurs in multiple shades and design patterns. Further, these stones can be given any desired shape as per the need of the project. Limestone is generally grayish in appearance, but also exists in many other shades like blue, brown, green, yellow and pink. Similarly, popular colors of sandstone are brown, black, red, gold, green, red and pink. Quartzite also occurs in several eye-pleasing shades like golden, black, green, silver, red and yellow. It also contains some tiny particles that have a tendency to sparkle; thus impart a unique look to the quartzite or other natural stone pavers. Climate of your area is an important factor that should be considered while choosing a stone for pathways. In case you are residing in an area, where the winter temperature generally reaches to freezing point, it is suggested to go for a dense stone like quartzite as it has the ability to withstand extreme cold. On the other hand, limestone and sandstone are highly porous (except a few variants) and easily absorb moisture. This makes them susceptible to get cracked upon freezing; hence not suitable for cold regions. There are numerous ways to install a natural stone in the outdoors. It could either used to fashion a pathway leading to your front door or as a decorative article like fountains in the front yard or garden. A stone also looks great when bordered around a planting bed. 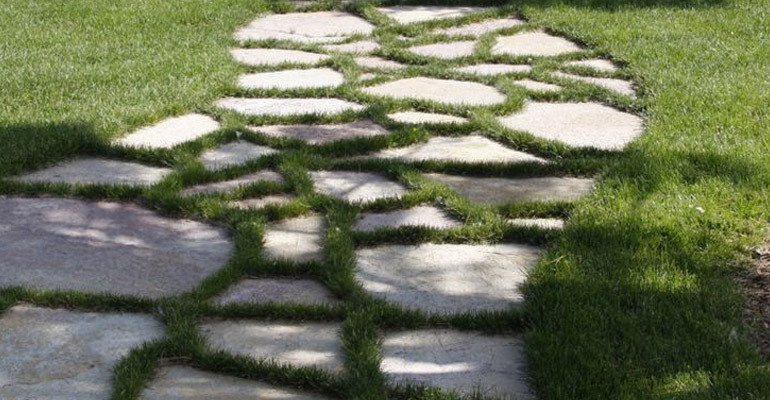 Natural stone pavers can be laid to form either a straight or S-shaped pathway. To make it more appealing, one can narrow or widen the path lengthwise at specific distances to create a zigzag pattern. If you want to play creative, you can come up with designs of your own, such as starburst or nautilus shape flagstone surrounding a circular stone. A 30 to 36 inch-wide pathway is considered ideal for a single person to walk, whereas a pathway with a width of nearly 48 inches is suitable for two persons to walk comfortably side by side. After the selection of stone and design, the next step is to develop the bed for the stone. Initially, a four to six-inch deep ditch should be dug using a shovel or sod cutter. If the design is somewhat complex, it is suggested to define the path using stakes and then filling in the boundary upside down using a spray paint. In the freshly dug bed, lay a base of crushed rock containing stone dust. Experts suggest that the base should be kept in a way, so that it gives generous amount of powder to compact and make the stone to stick well at their place. The bed should be filled up to 2 inches, so that the flagstone of varying heights could be lowered and raised accordingly to make the top surface flat and uniform. Thereafter, the base is packed downwards or made wet so that it gets compact. After laying the bed, it is time to select the stone with desired color and finish. The selected stone is then set in the bed by adjusting each of them to create an even and flat surface. For high-traffic areas like the pathway leading to the home, it is recommended to use a level gauge. The space between the stones should be kept ½ inch to 4 inches depending on the effect you want to create. A few people can also be found using a diamond blade skill saw to cut the stone and pack them tightly together without leaving any gap. You can also use commercially available polymeric sand to fill in the gaps between stones to bind the base material. As a precautionary measure, you can also use aluminum or plastic paver restraint, known as paver edging, to keep the stone at its place. Once the flagstones are set, the newly developed pathway can last a lifetime. To ensure this, all you need is to clean and maintain it at regular intervals. A good looking pathway not just adds value to the property, but also proves to be a great investment in the long run.